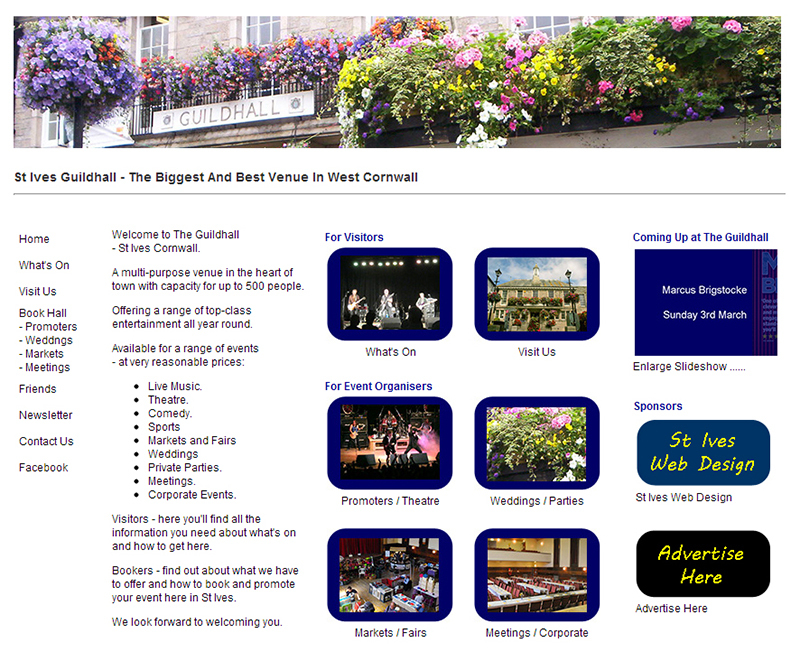 From April 2013 St Ives Guildhall will be managed by St Ives Town Council. Their intention is that the hall becomes a vibrant and busy venue - used by both the St Ives community and national event promoters. They hope to raise enough revenue not just to maintain the building and cover running costs - but also to invest in improved facilities. Any feedback on the site would be most welcome. It includes full event listings month by month for the next year. More will be added over the coming weeks. The site also includes information about booking the hall - and the prices are now very reasonable. As well as live music, theatre and comedy - you can book the space for your wedding reception, party, meeting, craft market or just about anything else. Mind Body and Spirit Fayre. Modern Dance - Close Distance. Live Music - The Orb. Plus the regular weekly St Ives Farmers Market and Rollers Roller Disco. Tickets for all events are available from St Ives Visitor Information Centre - many are also available online via Cornish Riviera Box Office. I'm seeking local advertisers on the site - especially restaurants and pubs that can benefit from pre-show diners and drinkers. As a lover of live music, theatre, comedy and sport I'm really pleased that St Ives Guildhall is going to be hosting so many events over the coming months. Looking forward to a few good nights out.